Babs Young writes: There seem to be lots of yellow lady slippers around right now. Don’t know if the pink ones just are not out or I have just not found any. I rather like their curly sideburns. Sideburns, eh? And all this time I’ve thought they looked like the long ringlets of Jane Austen’s characters. I with the Jane Austen thought rather than the sideburns. I’m with the Jane Austen ringlet idea too!! 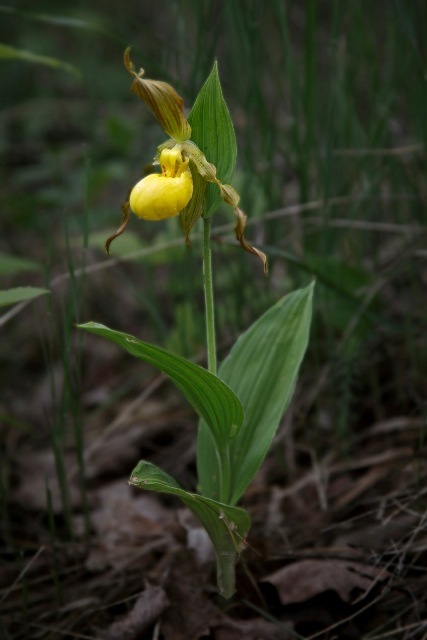 Are yellow Lady Slippers common there ? We have the pink ‘uns, but I’ve never seen yellow. Sybil, I’ll show you those yellow ones I was telling you about this week. My yellow orchids have come and gone. Interesting that you still have yours. I’ve never seen either one in the wild. Sybil sees the sidelocks that I see. Our pink ladyslippers were in full bloom exactly three weeks ago, so they’re probably gone by now. I’ve never seen a lady slipper in real life. The photos are marvelous, and they somehow look delicate and strong, all at the same time. What size are they? How tall? From the photo I’d say maybe six inches tall and the blossom about an inch across. Close?